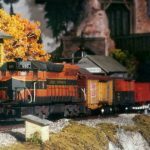 O Scale 9 ft x 17 ft – SMARTT: Scale Models, Arts, & Technologies, inc.
A nostalgic walk down memory lane is the prevailing idea behind the creation of this compact but superbly detailed model railroad layout. Taking a cue from Lionel trains of the post war era, this layout features Super-O track throughout, the prized toy train track of its day. Although this is a three rail layout running both Lionel and MTH trains, that is where the toy train aspect of this project ends. Scenery and structures on this layout are of award winning contest quality without compromise. Full interiors, entertaining vignettes, personalized signage, custom lighting, and sound effects, abound on this miniature treasure. The adventure begins with a detailed homage to the Baites (Bates) Motel, where a nasty shadow lurks behind the shower curtain, and Mother rocks in her chair under the gloomy nightlight. Or if that’s not your cup of tea, go two doors down to the C-D bar and grill, where all the miners from the Yours Mine and Our Mining Company wash away the day. See the ski slope, the li’l red school house, and the many charming industries, all guarded by the cop behind the billboard. Finally take a walk down Main Street where you can visit one of the many establishments, including the medical offices of Dr. Phil Goode, and Dr. Frank N. Stein.